Donald Trump has done something no other US President has done. He has done what he said he would do about the US Embassy in Israel. He has moved the Embassy from Tel Aviv to Jerusalem. The US President has had the authority to move the embassy to Jerusalem for decades. But previous Presidents, while making campaign promises to move the Embassy, did not make good on their promises. In a ceremony on May 14, 2018,several officials from the US were present to help celebrate the opening of the embassy. The date was significant. Exactly seventy years ago, on May 14, 1948, Israel declared herself an Independent State. The British Mandate over Palestine expired and the Jewish People's Council gathered at Tel Aviv to declare the establishment of the State of Israel. US President Harry Truman, on behalf of the United States was the first nation to recognize the newly formed State of Israel. Four hours after the declaration Egypt bombed Tel Aviv. In light of the history it was fitting that the US would be the first major nation formally to move its embassy to Jerusalem, the Capital of Israel. President Trump declared that it was time to recognize reality. Jerusalem is the Capital of Israel. 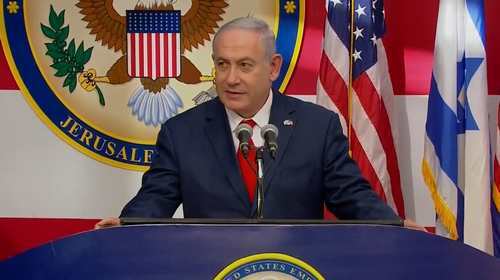 Prime Minister Benjamin Netanyahu was obviously moved by President Trump's commitment and action to make Israel's Capital City, Jerusalem, the home of the U.S. Embassy. A crowd of well-wishers cheered during the ceremony. Crowd of well-wishers at the ceremony marking the opening of the US Embassy in Jerusalem. A number of US officials were present at the ceremony. Though President Trump opted not to attend, presumably for security reasons, he did deliver a video broadcast of the event. Meanwhile many others represented him. 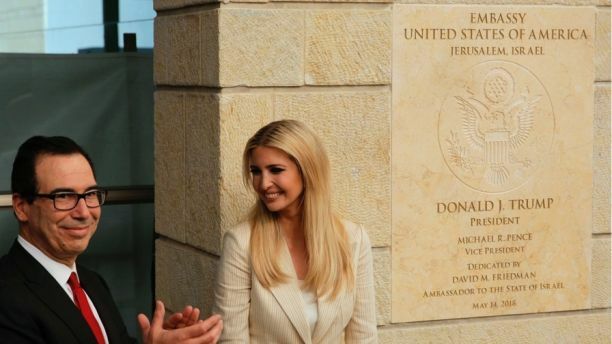 Among them were senior adviser and son-in-law of the President, Jared Kushner, the President's daughter and adviser, Ivanka Trump Kushner, Treasury Secretary Steven Mnuchin, and David M. Friedman, US Ambassador to the State of Israel. God has an eternal commitment to Jerusalem. Of all the cities of Israel, Jerusalem is God's favorite (Psalm 87:2). It is the city God Himself has chosen (1 Kings 11:13). Jerusalem will be the capital of Messiah's one-thousand year reign upon earth (Isaiah 2:1-4; Zechariah 14:2-4, 8-9, 11, 16-19; Rev. 20:4). And New Jerusalem will be the focal point of the eternal reign of God and His Christ (Rev. 21:1-22:5).